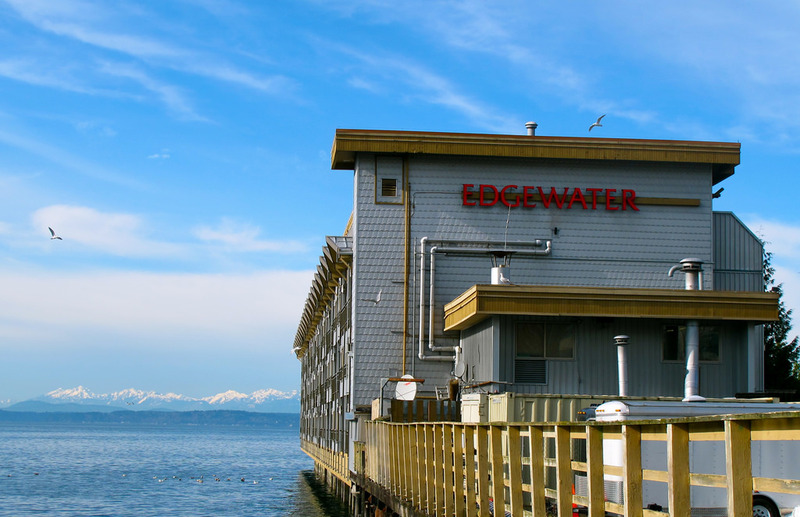 Seattle’s Edgewater Hotel sits at the edge of the ocean. It is the only overwater hotel of its kind in the city. Photo via Flickr, Curtis Cronn. 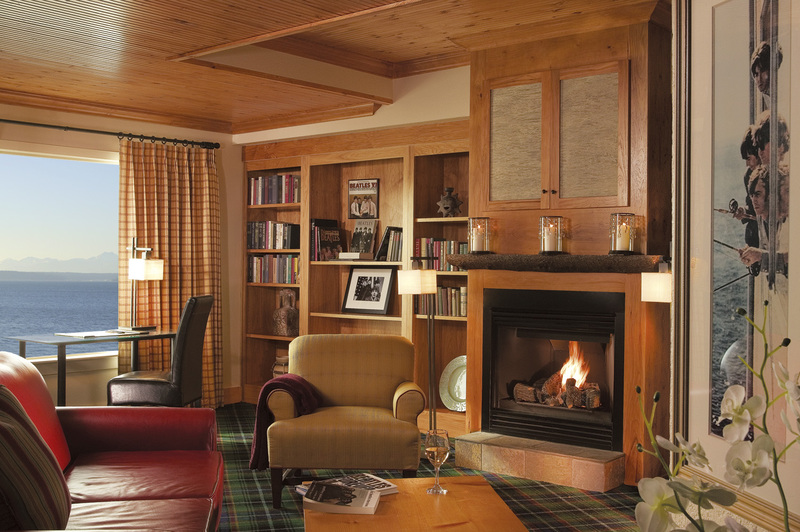 The Beatles Suite is the hotel’s most popular booking. 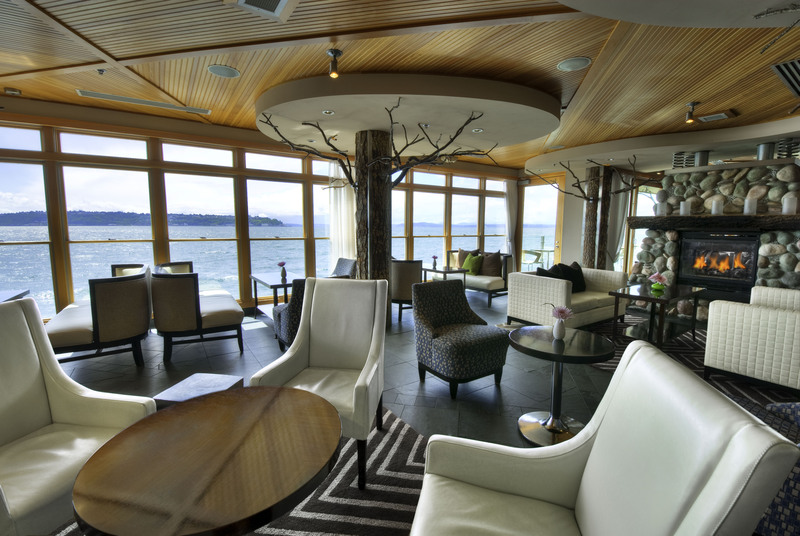 The oceanfront lounge at Six Seven restaurant. The Edgewater was originally built in 1962 for the Seattle World’s Fair. 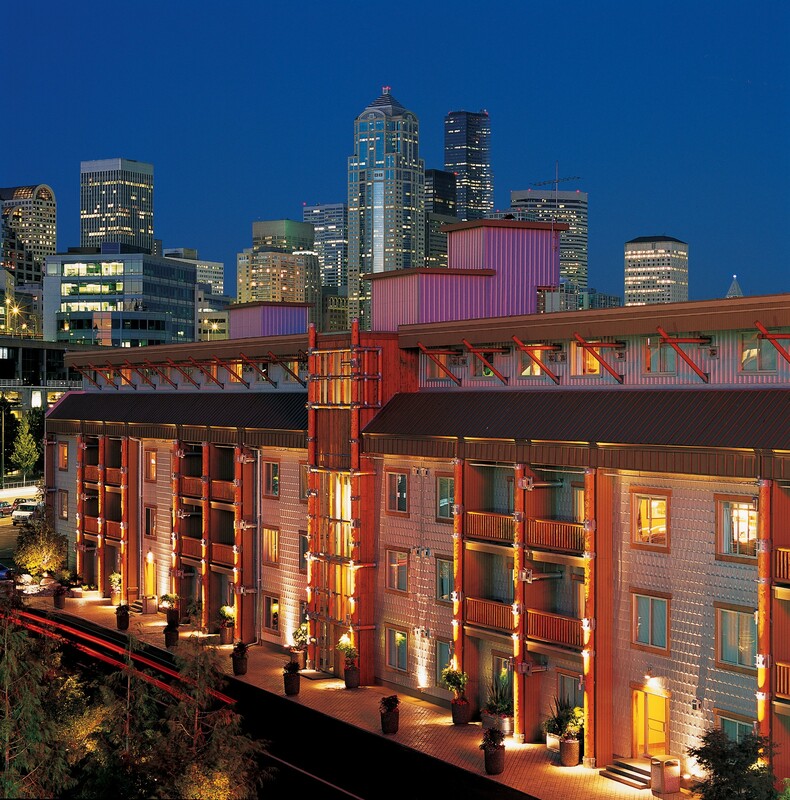 The hotel boasts spectacular views of Puget Sound and the Olympic Mountains. Seattle’s only overwater property gets musical. 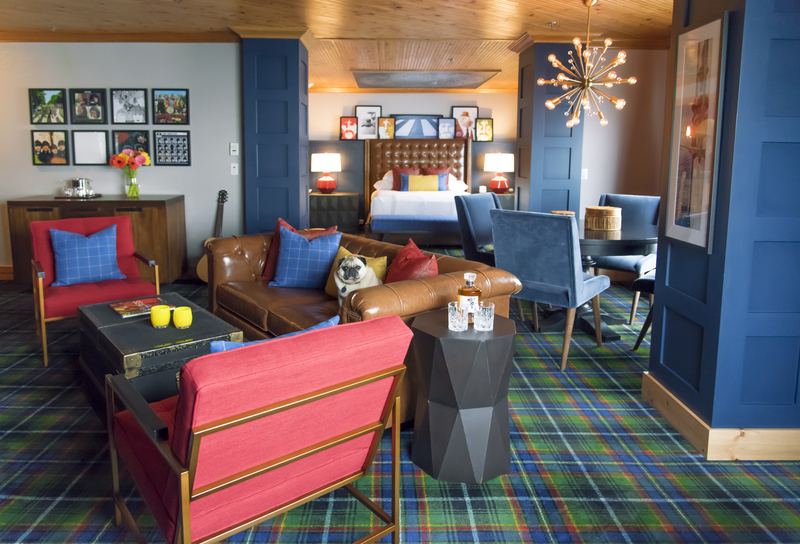 At first, Seattle’s Edgewater Hotel feels like a wilderness lodge. 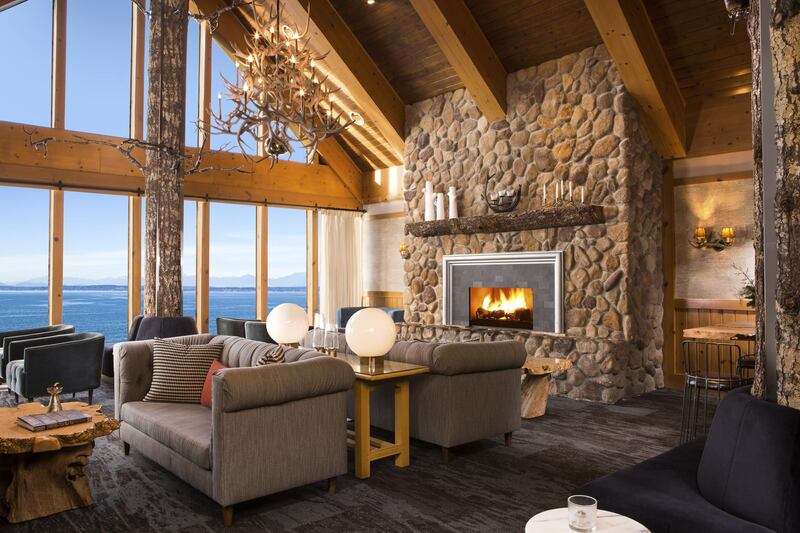 The lobby lounge’s forest motif, which includes tree branches affixed to bark-covered pillars and antler chandeliers hanging from the rafters, lends it a secluded, Pacific Northwestern atmosphere. But, as evident through the lobby’s picture windows, the hotel sits at the edge of the ocean rather than deep in the woods. 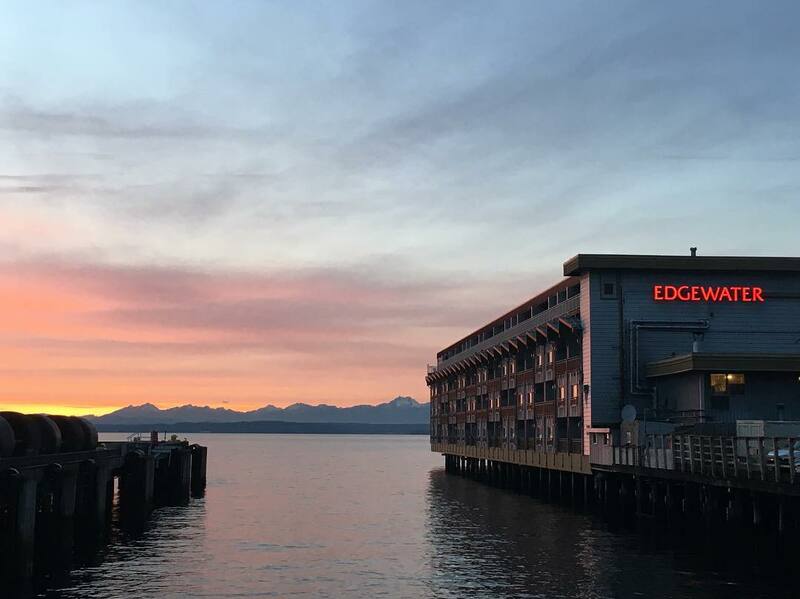 The property, a Noble House Hotel on a pier in Elliot Bay overlooking Puget Sound and the Olympic Mountains, was originally built in 1962 for the Seattle World’s Fair. It was, and remains, the only overwater hotel of its kind in the city (shoreline zoning changed after its construction) and today is beloved not only for its locale, but for a star-studded musical history that dates back decades. Blondie, Led Zeppelin, REM, and the Rolling Stones; Ozzy Osbourne, David Bowie, and Neil Young. All have stayed in their heyday, and the stories percolating around them are numerous. When KISS stayed, for instance, they were never spotted without their full leathery costume attire. When the Village People stayed in the late 1970s, they performed a spontaneous version of “Y.M.C.A” in the hotel bar after a few stiff drinks. Most famously, though, it was the Beatles, who checked in during their first world tour, in 1964, and cheekily fished directly out of their suite’s window. (And yes, John, Paul, George, and Ringo actually caught some fish.) To ward off fans, the hotel installed cyclone fencing around the hotel—some still tried to swim across Elliot Bay—and after their concert, the Beatles used taxis as decoys and were whisked back to the Edgewater in an ambulance. These days, their former room is called the Beatles Suite and is decked out in Beatlemania memorabilia. It is also, unsurprisingly, the hotel’s most popular booking. But no matter the room or suite, make sure to request oceanfront accommodations (the other side is a parking lot). There is nothing quite like lounging about in-suite, sipping tart grapefruit mimosas while seagulls kettle beneath the wharf. The pulse of the changing weather is palpable and it’s not uncommon to awaken in sunshine to calm turquoise waves, then retire in the evening to a crackling fireplace while a storm brews outside. The sensation of solid ground with the perks of being on the water—imagine a houseboat without the sickening sway—is intoxicating. And don’t be surprised if an occasional tour boat jets closely by; you’re staying at a local landmark. A permanent Edgewater Hotel music program was put into place last fall, Rock Stars & Guitars, for guests to flex their musical chops by checking out electric guitars and sheet music from local shop Emerald City Guitars. Songs by the likes of Zeppelin, Zappa, Van Halen, and Pearl Jam (Seattle residents themselves) are all available along with, of course, the Beatles. Don’t play? Not a problem—record players can also be borrowed along with a plethora of records provided by Easy Street Records, the ideal excuse for a private David Bowie DJ party. To keep in line with the musical theme, it’s worth heading out into the city to spot some famous local crooners, if luck is on your side. Insider tip: the hotel is a 15-minute walk away from Pike Place Market and the blink-and-you’ll-miss-it Matt’s in the Market restaurant, a sandwich shop secreted away on the second floor where the musically-inclined should keep eyes peeled for Seattle-based musicians such as Dave Matthews and Eddie Vedder—it’s a favourite of theirs.